At the parade to commemorate the 70th anniversary of the end of WWII and victory in the War of Resistance against Japanese Aggression. 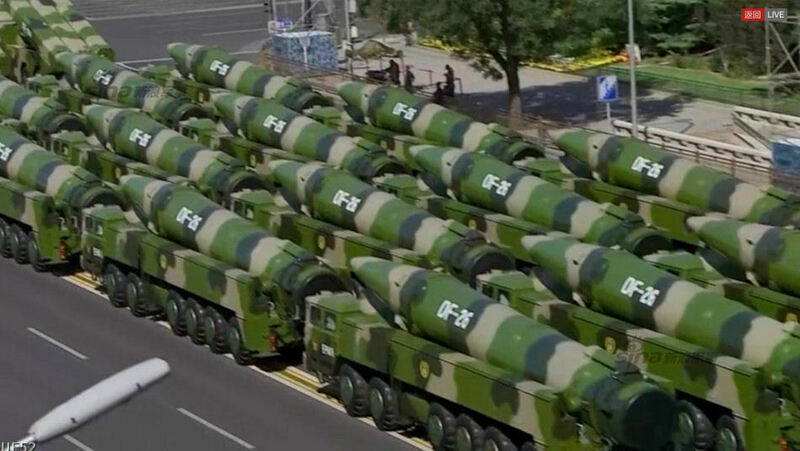 China unveiled at the parade on 03 September 2015 the latest-developed weaponry, including missiles dubbed the "carrier killer" and "Guam killer" missiles, an demonstration which has resulted from China's growing confidence and the obligations of a "responsible world power". The DF-21D anti-ship ballistic missile, the DF-26 intermediate-range ballistic missile, and the DF-5B intercontinental ballistic missile were the highlights of the parade. 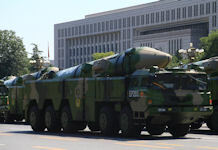 China announced on 10 May 2018 that its new intermediate-range ballistic missile capable of precision strikes against land- and sea-based targets has been deployed with the People's Liberation Army (PLA) Rocket Force, a move hailed by Chinese observers as part of the country's warning to Taiwan secessionists and aircraft carriers-powered US forces behind them. 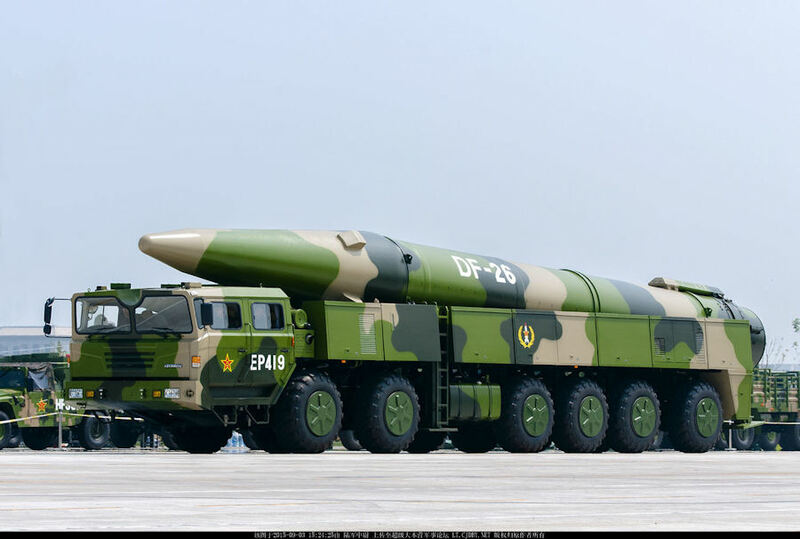 The Dongfeng-26 ballistic missile officially joined the combat sequence of the PLA rocket force after tests, Wu Qian, the Chinese defense ministry spokesperson, confirmed at a regular press briefing, according to the Ministry of National Defense website. The domestically-developed weapon is China's new generation intermediate-range ballistic missile capable of not only swift nuclear counterattacks but also precision strikes on medium and large targets on land and sea, Wu said. Dongfeng-26 can be loaded with conventional missiles or nuclear warheads, Global Times previously reported. It is a weapon "customized for supersized US aircraft carriers and amphibious assault ships," as the US is evidently behind Taiwan secessionists and Washington is interfering in resolving the Taiwan question, Song Zhongping, a military expert and TV commentator, told the Global Times. 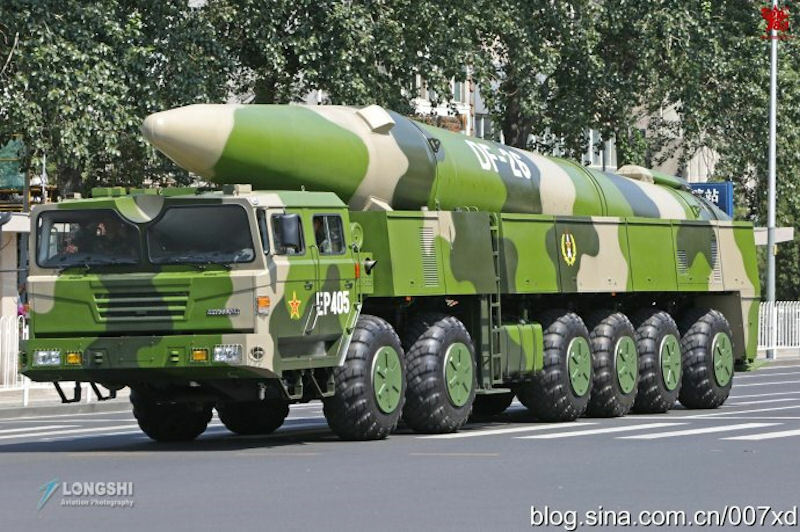 The PLA is developing a new conventional, road-mobile IRBM with a range of up to 4,000 kilometers (2,500 miles) from the Chinese coast. This range covers targets in the second island chain, such as U.S. bases on Guam, and could even include Northern Australia and Alaska.81 Although not confirmed by official US government sources, some analysts attribute this program to a Chinese designator, DF–26, which is also capable of carrying nuclear war- heads. 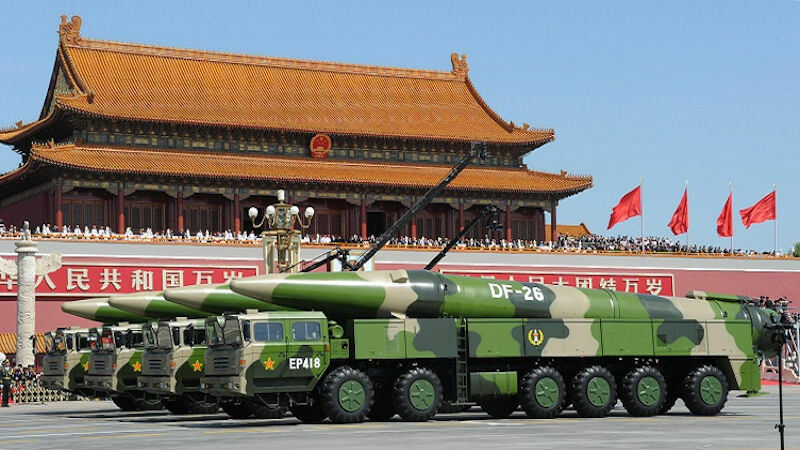 Official commentary during China’s September 2015 mili- tary parade indicated that the DF–26, clearly road-mobile, has both nuclear and conventional capabilities, fitting these descriptions. 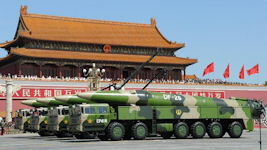 Official commentary during China’s September 2015 military parade indicated that the newer DF–26 IRBM, also road-mobile and solid-fueled, is nuclear- capable. The DF-26 intermediate range ballistic missile, dubbed the "Guam killer" in reference to US naval bases in Guam in the western Pacific, can strike the bases. "They are all defensive weapons, instead of offensive ones," said Rear Admiral Yang Yi, a PLA navy expert. Richard D Fisher Jr, writing in IHS Jane's Defence Weekly 02 September 2015, noted that "the newly revealed DF-26 intermediate-range ballistic missile (IRBM) may have an anti-ship variant. In addition to conducting "nuclear counterattack" missions, the DF-26 could also attack "medium-size ships at sea" as part of "conventional long-range precision strike", said the announcer. 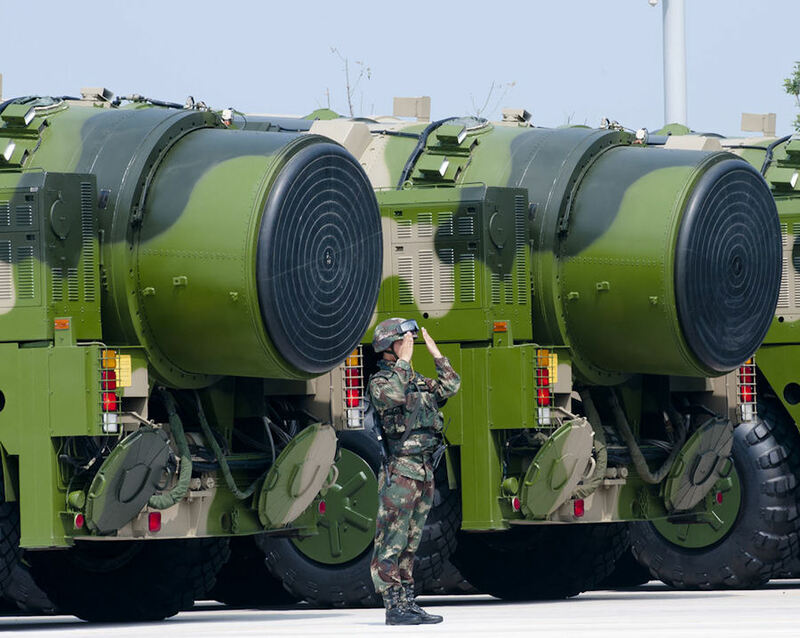 As the DF-26's estimated range is 3,000-4,000 km, this missile might enable the People's Liberation Army (PLA) to target US Navy formations in the "Second Island Chain" or out to Guam. The parade announcer's indication that it could target "medium-size ships" may mean the missile is accurate enough to attack destroyer-size ships in addition to aircraft carriers. 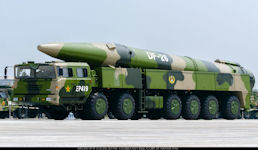 The DF-26 could therefore be regarded as a second-generation anti-ship ballistic missile (ASBM) in addition to the DF-21D, which was also revealed on 3 September for the first time. 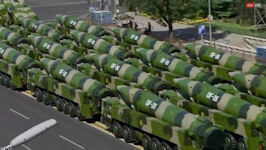 The DF-21D has an estimated range of 1,700 km." 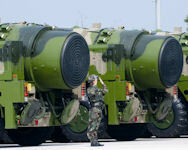 China's new DF-26 anti-ship ballistic missile has the capability to arm a nuclear warhead against an aircraft carrier. 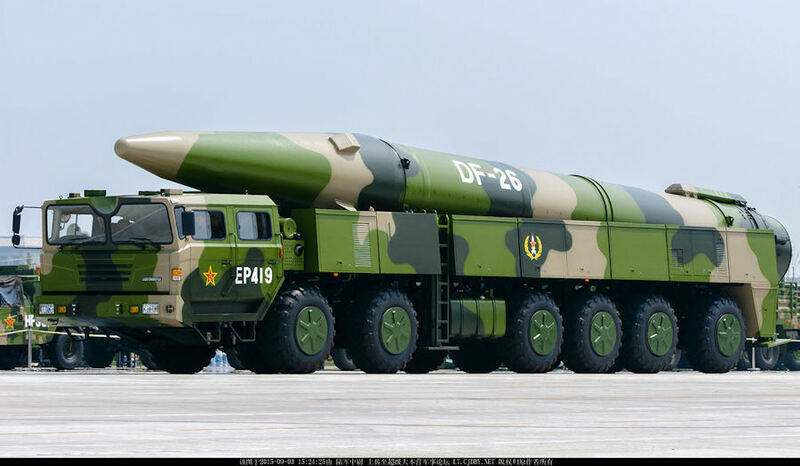 Unlike its predecessor, the shorter-range DF-21D, the new missile allows for nuclear warheads to be mounted on it, which lets China use its limited nuclear potential against both strategic and tactical targets. The missile aims to change the power balance in the South China Sea. The DF-26 does not rely on a pre-surveyd site for mobile launching. It can move fast, and it has no strict demands for where it is launched. So that is helpful to movement of missile forces all over and in concealment, and it is helpful to the rapid deployment, rapid launch, and rapid displacement of combat elements. 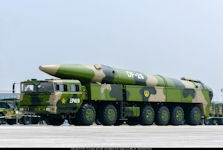 The WU-14 is likely to be carried by China's famous 'carrier killer' – the DF-21 intermediate range ballistic missile. A WU-14 HGV would also be mounted on the DF-26. THe HGV may extend the missile's range to over 3,000 km (2,500 miles). "I suspect that the HGV is intended more for anti-ship or other tactical purposes than as a strategic bombardment system against American cities,' Dean Cheng of the Heritage Foundation remarked as cited by the expert, 'An HGV might help resolve difficulties of hitting maneuvering targets with a ballistic missile." In June 2015 Beijing conducted a fourth test of its hypersonic glider vehicle (HGV), called WU-14 by the Pentagon, which is purportedly aimed at overcoming US missile defense; the distinguishing feature of this test is that the WU-14 has performed so-called 'extreme maneuvers,' US expert in civil-military relations and cyber diplomacy Franz-Stefan Gady elaborated. The WU-14, which is capable of delivering either conventional or nuclear warheads, was launched into space by an intercontinental ballistic missile (ICBM) booster, and then returned to Earth's atmosphere, gliding at up to Mach 10 speed (around 7,680 miles per hour). During the gliding phase the WU-14 HGV is conducting 'extreme maneuvers' in order to evade interception and at the same time extending the range of the missile. Unlike conventional 'reentry vehicles' which go down through the atmosphere 'on a predictable ballistic trajectory,' a hypersonic glider is much more difficult to intercept by conventional missile defense systems, the expert explained. Citing US defense and national security reporter Bill Gertz, the expert suggested that the WU-14 'threatens to neutralize US strategic missile defenses with the unique capability of flying at ultra-high speeds and maneuvering to avoid detection and tracking by radar and missile defense interceptors.' However, US high-ranking military officials have yet neither confirmed nor denied that the W-14 HGV pose a threat to US domestic missile defense systems. China likely faces significant engineering challenges in developing gliders with longer ranges of a few thousand kilometers or more; another challenge will be to ensure the reception of navigation data given the high speeds of the gliders. While a 500–2,000 kilometer (300–1,250 mile) total range for the glider in 2020 would be ambitious but not unreasonable, the existing glider model likely could not simply be placed on an ICBM to achieve intercontinental range.